They were just in time! I live in Plum and about 8:45 PM my husband and I happened to be outside as a very large V of birds passed overhead but they were not Canadian Geese. The birds looked silvery/gray in the night sky. My husband thought they sounded like a pack of puppies, I thought they sounded like a type of owl. I looked it up online and it thought they might have been Tundra Swans. Your article and the sound byte confirm it!! That is exactly how the birds sounded, very exciting!! Thanks for your great articles, Kate! While I was working in my parents yard yesterday (near I-79/uphill from Ohio River), a distant sound like yappy dogs came into earshot, then got closer and closer; I even thought it might have been coyote chatter, but since it was only 2:00 in the afternoon, I thought that was odd…then along the horizon, maybe 20 or so mostly white/black geese (?) came into view and quickly vanished. My first thought was snow goose – a species I’ve never seen before. Is it still considered uncommon for them to pass through Western PA? Could they be headed to Middle Creek in Lancaster, or the coast? The encounter was so brief, but the sound was distinctive! 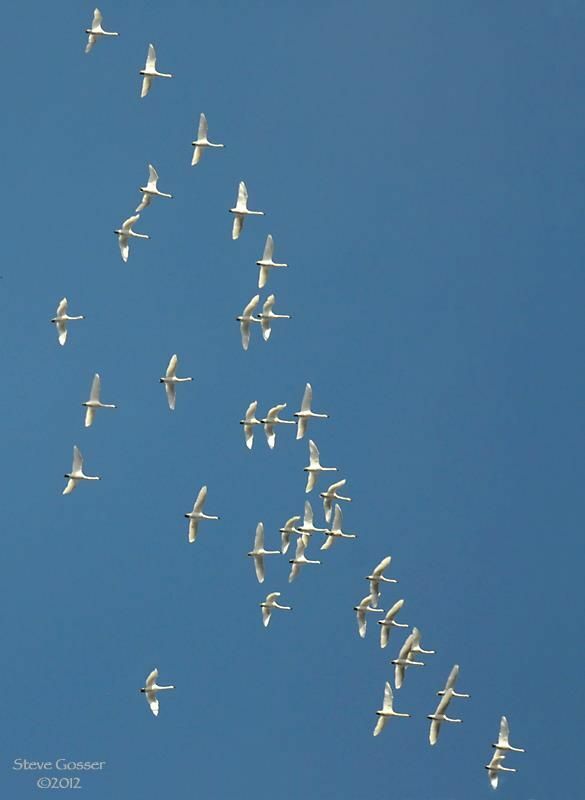 Wed, Nov 14, 11am: A flock of about 40 tundra swans flew over my house heading southeast. Yay!